The European Central Bank October Monetary Policy statement was released yesterday following the governing council meeting which was held, on this occasion, in Malta. The statement contained the phrase “The degree of monetary policy accommodation will need to be re-examined at our December monetary policy meeting”. Apart from that there was no change to the status quo with regard to Quantitative Easing (QE), and no movement in interest rates, either core or deposit. There had been commentary to the effect that ECB overnight deposit rates, which are already negative (it now costs banks to have the ECB mind their money on a short-term basis) might be pushed even further below zero. The statement was bearish for the Euro, causing it to fall against its major counterparts, most notably the US dollar. However, the effect on the Forex market of the subsequent remarks of a somewhat exhausted sounding Mario Draghi was nothing short of dramatic. The initial fall was greatly accelerated as the press conference proceeded, and as the President answered reporters’ questions. He repeated a new phrase on a number of occasions. This was: “We are not in wait and see mode but work and assess mode”. The market seems to have interpreted this and other comments to mean that the further expansion of QE and / or a further reduction in the deposit rate is a racing certainty at the next meeting, precipitating the fall in the Single Currency. From a Technical Analysis (TA) point of view, yesterday’s move just stopped short of being what aficionados call a ‘structural’ one. 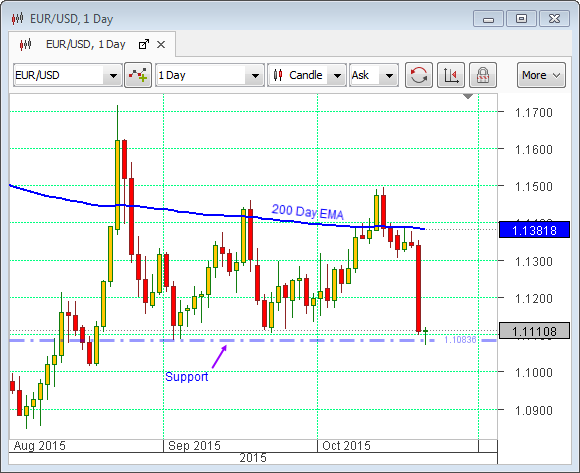 On the chart at the top it can be seen that the EURUSD exchange rate has come to rest, after neatly slicing through the round number levels at 1.13 and 1.12, which might have been regarded as support, at the exact price point where there is a support level that has held now since mid-August. If it were to fall below that level on a consistent basis in the coming days and weeks, it will have broken out of its range and the graph will have assumed the characteristics of a new downward trend. Hence the term ‘structural change’. This is where Technical Analysis meets Fundamental Analysis: such moves are invariably initiated by an event. Yesterday’s press conference would qualify under this heading.